The Forest Lawn memorial parks are renowned for the many movie stars buried there, so I suppose it's appropriate that this Forest Lawn in the Hollywood Hills overlooks Disney Studios, Universal Studios, and Warner Bros. There aren't quite as many Hollywood celebrities buried here as there are at the original Forest Lawn park in Glendale, but there are still many notables to be found, including Bette Davis, Lucille Ball, Telly Savalas, William Conrad, Buster Keaton, Liberace, Freddie Prinze, Andy Gibb, Jack Webb, Stan Laurel, Ricky Nelson and many more. More recently, Brittany Murphy, John Ritter, Gene Autry, Sandra Dee, Lou Rawls, Rod Steiger, Isabel Sanford, David Carradine, and Steve Allen have been buried here. The funeral for superstar Michael Jackson took place at the Hall of Liberty, on July 7th, 2009. But he was buried permanently at Forest Lawn Glendale (not here at Forest Lawn Hollywood Hills). Actress Debbie Reynolds ("Singin' in the Rain") and her daughter, Carrie Fisher ("Star Wars") were buried here, together, on January 6, 2017. Click here for more details about their location at the park. Located near Griffith Park, this Forest Lawn is only ten minutes west of the larger Forest Lawn cemetery in Glendale, and it shares much in common with its older sibling. However, the emphasis here is more on old-fashioned patriotism (rather than on Renaissance art), with towering statues of American Presidents, and replicas of historic, Revolution-era churches. The park is huge; acre after acre of lushly landscaped, gently rolling hills and manicured green lawns, dotted with gleaming white statues. Be sure to pick up a general map of the grounds at the information kiosk when you first drive into the park. You'll need it. The map doesn't list stars' graves, but it will at least help you locate streets and general areas within Forest Lawn Hollywood Hills. Then you can use the maps I created (found in this article) to pinpoint individual graves. Finding a star's grave is rarely a simple task at any park, and because Forest Lawn is so large (and since they won't divulge information about stars' graves), it can be especially difficult here. The easiest way for the casual tourist to locate famous names here is to head immediately for the Court of Remembrance, a collection of outdoor mausoleum walls on the east side of the park. Here, the above-ground vaults are numbered (by tiny plaques at the bottom of each row), and it's relatively easy to find the markers of several big-name stars. Once you drive into the main gate, turn left (east) and follow the map to Vista Lane. Park out at the curb on Vista Lane, in front of the main entrance to the Court of Remembrance. Bette Davis was one of Hollywood's biggest stars. In fact, AFI listed her second on their list of all-time greatest actresses (behind only Katharine Hepburn). Her films are legion: "All About Eve," "Dark Victory," "Now, Voyager," "Hush...Hush, Sweet Charlotte," "Whatever Happened to Baby Jane?" and "The Whales of August," to name just a few. She was Warner Bros' top star in the 1940's, and, at the time, the highest-paid woman in the United States. Her footprints are among the stars immortalized in the forecourt of Grauman's Chinese Theatre. She won the Academy Award for Best Actress twice (in 1932's "Dangerous" and again in 1938 for "Jezebel"), and was nominated for the Oscar a total of eleven times. Even more impressive, she achieved this level of popularity despite the fact that her roles often tended to be unlikable characters: brusque, vain, haughty... Neither was she a classic beauty, although her "Bette Davis Eyes" (which inspired a popular song), were large and expressive. Memorable lines from her movies include "What a dump!" and "Fasten your seatbelts, it's going to be a bumpy night." The marble tomb, marked "Davis," also shelters her mother, Ruth, and her younger sister, Barbara. The inscription under her name reads: "She did it the hard way. " Click on the small photos to see larger pictures. When facing the Bette Davis tomb, the central entrance walkway to the Court of Remembrance is just to your right. Stroll (east) down this central walkway, through the entrance and into the first garden area. Turn to your right and follow the west (east-facing) wall of crypts. There, you'll find is the black marble wall crypt of actor Charles Laughton (1899-1962). Laughton was perhaps best known for his role as "Captain Bligh." in 1935 version of "Mutiny on the Bounty" (opposite Clark Gable's "Mr. Christian"). But he also starred in "The Canterville Ghost" (1944), "Ruggles of Red Gap." (1935), and "The Hunchback of Notre Dame" (1939). In 1932, he won the Academy Award as Best Actor, for "The Private Life of Henry VIII," and left his footprints outside the Chinese Theatre. Charles Laughton's crypt (#310) is made of black & dark green marble (most of the others are white), and is located three rows up from the bottom and ten markers from the southwest corner. Kittycornered to Charles Laughton, against the south wall, is an unusual marker inscribed with a roaring lion. This is the crypt of famed animal tamer Clyde Beatty (1902-1965), one of the most renowned performers in the history of the circus - the first performer to enter a cage full of lions, armed with only a whip and a chair. 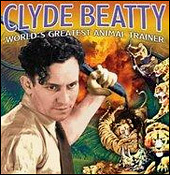 He also appeared in a few motion pictures, and even had his own "Clyde Beatty Radio Show," featuring stories of lost cities and jungle adventures. His Clyde Beatty/Cole Bros Circus still lives on today. Beatty is in crypt #2175, two markers up from the bottom, and three markers to the left of the corner. Look at the marker near the lower left corner of this statue, and you'll find the niche of comic actor Alvy Moore (1921-1997). The name may not ring a bell, but if you were a fan of the wacky 60's sitcom "Green Acres", you'll remember him as the forgetful and always-confusing "Mr. Kimball" (otherwise known as "Hank"), the Hooterville County Agent, who made the lives of Eddie Albert & Eva Gabor a bit more interesting on that popular show. Rural sitcoms dominated TV during the mid '60s. The same company that gave us "Green Acres" also had such hits as "Petticoat Junction" and "The Beverly Hillbillies". In fact, those three shows often crossed over into one another, with characters from one show guest-starring the other shows. Speaking of the "Beverly Hillbillies", remember 'Mrs. Drysdale'? The the rich, stuffy, society matron (and wife of the banker, 'Mr. Drysdale') who lived next door to the Clampetts - and who was always outraged at their antics and did her best to get rid of the hillbillies? Well, it's a small world. Turn to your left in this small room, and look at the wall (to the left of the door when you walk in), then count 7 spaces over from the left corner and 8 spaces up from the bottom, and you'll find the small niche containing the ashes of the character actress Harriet MacGibbon (1905-1987), who played 'Mrs. Drysdale'. But to make things more complicated, her name on the niche is her married name: Harriet M. White.